Lassie was a great dog. So was Benji. Rexxx the Firehouse Dog was also excellent, once he put away the skateboard and sunglasses. But did any of those dogs put it all on the line every day for their country?! And what about you, Joe and Jane Multiplex? Do you know the true meaning of honor, loyalty, and self-sacrifice? Because all those domesticated movie dogs are certainly not going to teach you. Only a rigorously trained Belgian Shepherd of the highest moral caliber can do that. These are the type of thoughts inspired by Boaz Yakin’s Max, which tries to get away with standard-issue dog-adventure tropes by assuming the exultant tone of other coming-home dramas about heroic Marines. 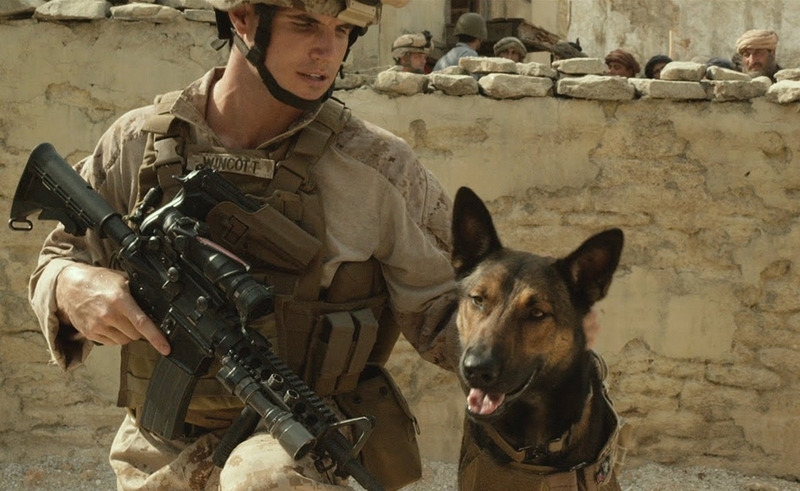 And while there are indeed dogs that serve in war zones—the film has the stats and photos to back it up—Max drafts off their exploits in a bid to give Yakin’s tacky manipulation and predictable, beat-by-beat storytelling a patina of inspirational greatness. The two-legged are asked what they, too, can do for their country, even while they’re trapped in a narrative Lassie could write by rote, if she had opposable thumbs. But Max is a bigger, nobler movie than that, because it says it is. The messaging begins early by contrasting Justin (Josh Wiggins), an apathetic layabout who burns videogames illegally, when he’s not immersed in them, and his older brother Kyle (Robbie Amell), who’s sweeping villages for Taliban stockpiles in Kandahar. When Kyle dies in combat, his intrepid working dog Max, a Malinois, comes back to Texas with PTSD, and his behavior is so erratic that the military wants to put him down. But Max takes a liking to Justin, and the boy reluctantly likes him back, enough to give the first-person shooters a rest and work on getting the dog to feel safe and cared-for again. Trouble comes in the form of a Marine (Luke Kleintank) who served alongside Kyle and who doesn’t much like Max (and vice versa), particularly when the dog threatens to break up his gun-smuggling operation. For Justin, doing the right thing involves defying his father (Thomas Haden Church), himself a former Marine wounded in Gulf War I, and running afoul of a Mexican cartel. That’s right: a Mexican cartel. There’s a touching story here about a boy getting over his grief and narcissism by nursing a dog through its own set of traumas, but Max is far too gung-ho about playing up the pup’s heroism and self-sacrifice to give it much time to develop. Just the concept of having the family visited by a diabolical ex-serviceman—shades of The Guest—takes Yakin and co-screenwriter Sheldon Lettich far off the track, and ramping up the stakes by involving a cartel thug adds to the tortured plotting. Meanwhile, Yakin consigns Church and Lauren Graham to roles as Justin’s parents, but doesn’t take a second’s advantage of their formidable comedic chops. Once the gun-smuggling plot kicks in, Max permanently shifts gears to action-adventure, as hapless men with guns and vicious dogs of their own square off against the fast, resourceful, courageous Malinois, which can snuff out these losers just as surely as it can find a cache of Taliban RPGs. Divorced from the military context, nothing happens in Max that hasn’t happened around other movie canines. But this is a Marine dog going through these contrived situations. Show a little respect.